For those looking for the ultimate statement in outdoor decor, the St. Remy Fountain with its sculptured centerpiece made to draw about the epitome of distinction and sophistication. The cast-stone St. Remy Fountain weighs 870 pounds and displays a never-ending cascade of water for all to see. 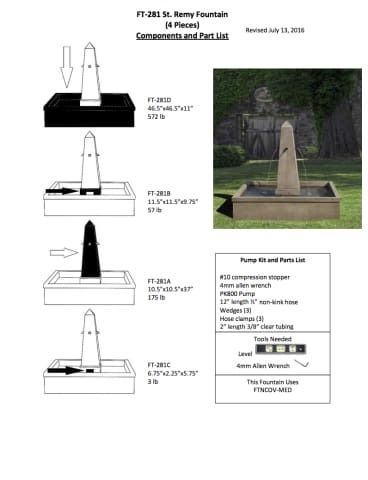 For a detailed step by step assembly guide of the St. Remy Fountain please call our Team of Garden Fountains experts at 1-877-780-6699 for assistance. The St. Remy Fountain is 50 inches tall, 46.5 inches in wide and weighs 807 pounds.